Fall is in the air and that means football and pumpkin baking for us. On Saturday afternoon, Josh turned on the football games and I started baking. To kick off football and pumpkin season, I made pumpkin Nutella bread. 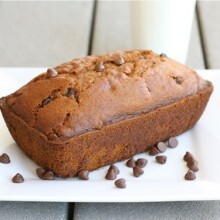 If you like pumpkin chocolate chip bread, I have a feeling you will love pumpkin Nutella bread. I started with a basic pumpkin bread recipe-pumpkin, cinnamon, nutmeg, and vanilla. I love all of those flavors, so I was off to a good start. I divided the batter between four mini loaf pans. I love the mini loaves of bread:) I opened a jar of Nutella and scooped two heaping tablespoons onto each loaf of bread. Using a knife, I swirled the Nutella into the pumpkin batter, creating an orange and chocolaty loaf. While the loaves were baking we cheered on our favorite football team and enjoyed the smell of pumpkin that was gently warming the house. At half time, I sliced into one of the mini loaves. I loved the contrast the dark Nutella swirl added to the pumpkin spiced bread. I am glad my first taste of pumpkin this fall involved Nutella. What a delightful combination! I can’t wait to make this pumpkin Nutella bread for Halloween-it will be perfect for the holiday. Add pumpkin Nutella bread to your fall baking list today! 1. Preheat the oven to 350 degrees F. Spray 4 mini loaf pans with cooking spray. Set aside. 2. In a medium bowl, whisk together flour, baking soda, salt, cinnamon, and nutmeg. Set aside. 3. In a large bowl, whisk together sugar, oil, water, pumpkin, eggs, and extracts. Whisk until smooth and combined. 4. Slowly stir in the flour mixture. Mix until ingredients are combined. 5. Pour the batter into the mini loaf pans, making sure batter is evenly divided. Drop 2 heaping tablespoons of Nutella onto each loaf pan. Swirl the Nutella into the pumpkin batter with a knife. Place the loaf pans onto a baking sheet and place in the oven. Bake for 40-45 minutes or until a toothpick comes out clean. 6. Place the loaf pans on a wire rack. Cool for 15 minutes in the pan and then carefully remove the loaves. Cool completely before slicing. *Note-You can make regular size loaves. This recipe should make 2 8x4 loaves. Adjust baking time to about 60 minutes. A delicious and seasonal combination! I have no doubt I would love pumpkin nutella bread!! Oh my, what a combination! Time to break out the pumpkin for the season! Oh my gosh what a fabulous combination! That sounds incredible! wow! what a great idea! I will definitely be trying this out once it gets cooler down here in the deep south! looks delicious! I currently have one can of pumpkin in my cupboard that I’m hoarding because I can’t find any more. This just might be the recipe to use it on! That combo sounds wonderful! I love that you can see the swirls of Nutella!! Yum! I never thought I could love pumpkin bread more than I already do, but adding Nutella could make me love anything more. Yum! Two things I love in one little loaf! Can’t wait to try it. Yes, football is really here big time. I could hardly get out of my driveway on Saturday because of all the traffic! Your bread looks wonderful and it sounds like a perfect bread for fall. Yum… That pumpkin bread looks fantastic. I am totally ready for football season, and I love all things pumpkin. I’ll definitely be trying this one. Looks wonderful! Definately bookmarking this one! What an amazing combination! Wow! Looks delicious Maria! I would love a slice right now. Gorgeous pumpkin bread! Love the addition of nutella! I’m in love!! Definatley making this asap! This sounds divine! all of my favorite ingredients!! 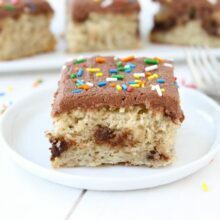 Nutella Pound Cake is still the most searched for recipe on my site. People love their Nutella! I love pumpkin bread and am hesitant to tinker with my favorite recipe, but this sounds pretty darn good. I love this time of year because it means I can make pumpkin goodies! This bread looks wonderful. Ok Girlie..we are thinking alike these days! I made your yummy zucc. brownies yesterday. They were a hit! This morning I just got out y pumpkin bread recipe so I can make it this afternoon! I may use your nutella idea if I can get t othe store! I could definitely go for a slice of this for breakfast this morning! … And tomorrow morning, and the morning after that. It looks wonderful, Maria. Great job! 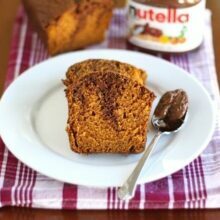 Oh my, adding nutella to pumpkin bread is dangerously genius! Love anything pumpkin! In fact I am baking pumpkin today! Ahhh! I so badly want to run into the kitchen and make this but I’m not giving in to pumpkin baked goods until it’s officially Fall (on the 23rd) so I’l have to wait. Besides it’s still in the 90’s here- ugh! Oh yum! Pumpkin is my favorite fall flavor. This sounds great. I would have never thought to add Nutella. Fabulous! this makes me so excited for fall baking! i love nutella. i know i’ll be trying this! This is perfect for this time of year — and the combination, oh my! Fall = Football. I love fall season. Weather is perfect and sports on TV is at its best. Agree, this is perfect for Halloween. Looks delicious and moist! wow two flavors that I could defiantly like to eat! I think you have somehow managed to hit every one of my cravings with this bread! Awesome. Yum! Great idea! I know I will definitely be making this in the future. That looks so ummy! Visiting you from Mingle Monday. Your blog is absolutely gorgeous! Can’t wait to read more. What a great idea! Chocolate and pumpkin is an awesome combo, so nutella must rock! This looks and sounds amazing! I love pumkin chocolate chip bread and I love nutella! I have just been itching to bake something with pumpkin, but, I can’t find any pumpkin at any stores by me…hopefully soon! This will be on the top of my list to try! Creative with a bit of thanksgiving thrown in. I baked a pumpkin cheesecake with nutella swirls last year…yum! Lovely Maria! Love the colors and flavor combo, clever & delish. what a delicious sounding bread – although it is spring down here we will be celebrating thanksgiving this year with friends and this is now on the menu. thanks! Amazing bread! I love pumpkin and I love Nutella – great combo! I’m not really a big fan of pumpkin and chocolate together, but oh my this looks divine! I’m sure I would love this. 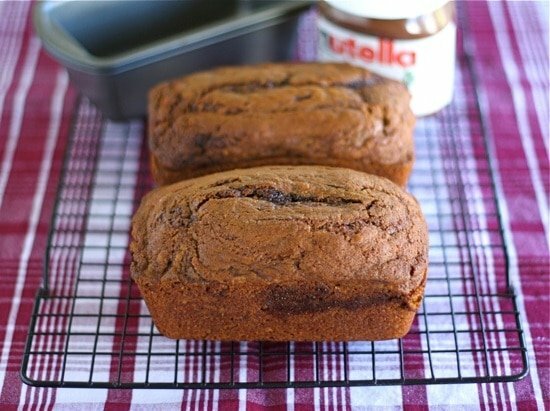 I made a banana Nutella bread last year that was fabulous! That looks so good. I just might have to try this later this week 🙂 I’m a huge Nutella Fan! obsessed. For sure making this the second I get my hands on some pumpkin!! I love pumpkin bread, and I love Nutella. I’ll definitely be trying this out… thanks for sharing! I love pumpkin bread! This looks divine. Everyone’s way ahead of me on Fall flavors. I’m still thinking summer 🙂 I love pumpkin bread, but have never tried Nutella if you can believe it. I think we’d really enjoy this. Yum! Sounds so good. My chef friend, Paige, (www.acookinglifeblog.blogspot.com) made a chocolate and sweet potato loaf cake in one of her classes I took last year that was SO good, your pumpkin bread reminds me of that. What a great idea to add Nutella! I Love pumpkin bread to add Nutella genius! Maria, love the combination of pumpkin & NUTELLA! <3 & thank you so much for including my Nutella Milkshake in your roundup Mwah! Oh Maria you are genius, what a winning combination!! You have seriously taken it over the top with this one Maria. As if pumpkin isn’t great by itself you went and added Nutella. GENIUS!!!! I am SO excited for all of the fall flavors…especially pumpkin! I have never even considered pumpkin and nutella together, but it looks delicious! 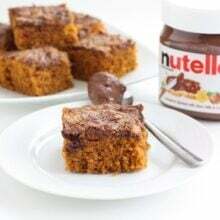 Pumpkin bread with Nutella, wow, I have to try it. I have not made many things with Nutella before so this is gives me an incentive to make something yummy. pumpkin is usually a turn-off for me, but the nutella saves the day! OMG You’ve just combined two of my favorite things: pumpkin bread & Nutella! Definitely going to have to try this! This look absolutely wonderful! Thank you for posting this! I am so mad I can’t find pumpkin anywhere, but when I do I will stock up and this will be at the top of the list! I LOVE this. Love, love, love this. Have I mentioned how much I love this recipe? Oh my goodness…pumpkin and Nutella? You have got to be kidding me. I love this. Looks divine! I tried a nutella swirl poundcake once, it tasted good, but the nutella sunk to the bottom! It ended up with poundcake on top, and a nutella-flavored brownie-constitency on the bottom. Anything pumpkin or nutella is a dead winner for me! Looks perfect to me. Love both pumpkin and Nutella! What a great idea. 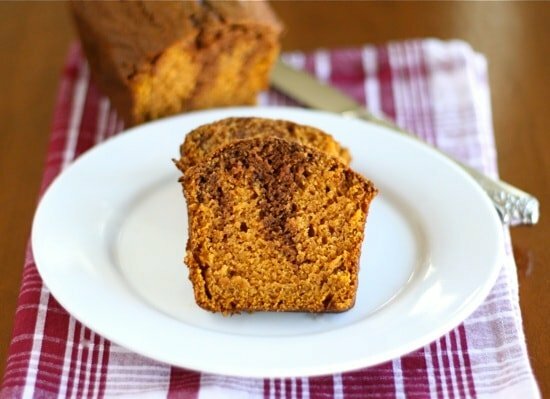 I’m always looking for nutella recipes and I love pumpkin bread. The nutella swirl sounds delicious. I’m definitely going to try this out! You could add Nutella to brussels sprouts and I’d be licking it off the plate. Great recipe and it looks delicious. Two of my all-time favorites: pumpkin and Nutella — yum!!! Yay fall! This is calling my name! Nutella and pumpkin – what a tempting bread. what a great idea combining two of my favorite things. Can’t wait to try this recipe. Today was not a good day to forget my lunch at home – especially when I see recipes like this that make me really hungry! This looks crazy good Maria. Gotta try it soon! The recipe sounds wonderful! Although I can’t seem to find hazelnut extract ANYWHERE. Is there a good substitution for this? I got my extract at Whole Foods. If you can’t find it, just leave it out. It will still be tasty! Two of my favorite things: pumpkin and nutella. Thanks for sharing – can’t wait to try it out! Holy cannoli – I must try this recipe, and soon! My mouth is watering…I bet this flavor combo is divine! I made this over the weekend and it’s delicious! I made the two full-size loaves and, although I’m embarrassed to admit it, my husband and I already polished off one of them. Oh, well…it’s just that good! Great idea – sounds fantastico! My son loves Nutella, this is going to make him so happy! Going to try the milkshake and brownies too 🙂 Maybe a Nutella Blondie??? That sounds good. This looks so good! Reminds me of a recipe my mom used to make called Harvest loaf cake. It had mini dark chocolate chips in it and was completely addictive. Thanks for sharing! Made this last night and I don’t know that my house has EVER smelled as good! I doubled the recipe and made 2 large loaves, they turned out perfectly. Had some pumpkin left so made another batch; ran short on flour so added some quick oats. Made this batch into muffins and they are fantastic, too. Brought some to work and they disappeared very quickly. Thanks for letting us know! So glad the recipe was a hit! YUM. I’ve been on vacation and am finally catching up on blogs—this looks awesome and just might get made this weekend! I don’t have mini loaves–would this be 1 big or 2 big? Also is the nutella flavor very strong? I get disappointed when I use nutella in baking and you can’t taste it! If you want an overkill of Nutella, swirl in extra:) It is pretty strong though. You can make 2 8 by 4 loaves with this recipe. I hope you like it! SERIOUSLY – there needs to be a law against such goodness! 😀 My two favorites are now married in a bread and I have you guys to thank!!! I hope you like the bread. I also have a pumpkin chocolate chip bread recipe on my site. Check it out too! Love it! Sounds strikingly similar to our Saturdays…. Oh my heaven. That sounds so good – I am bookmarking this for myself so I can get back to it. Wow. Absolutely yum!! Thanks!! I’ve always enjoyed pumpkin bread, but your addition of Nutella would really make the flavor pop. Beautiful loaves. Made this last night and loved it! Thanks for the delicious recipe! I also made this last night, and it was super tasty, especially warm right out of the oven! Made this last night. It was FABULOUS and a big hit with everyone who tried it. Thanks for sharing! Thanks for letting us know. Glad everyone liked the bread! I bought a bottle at Whole Foods. If you can’t find it, just leave it out. It will still be good without it! thanks for your quick reply! you were absolutely right! i made the bread last night and got rave reviews from coworkers. out of curiousity, how does the hazlenut change the flavor? just nuttier? I am glad the bread got rave reviews! Yahoo! made this for a Halloween party last night, was a HUGE HIT! thanks for the recipe!! Just made these in muffin form for my first pumpkin recipe of the season (a little late, I know), and they are inSANE. Absolutely delicious. Check them out if you like, and thank you!! I’ll be keeping this pumpkin base as my go-to. Glad the recipe worked for muffins too. I will have to make muffins next time around. Just found your website and can’t wait to try this recipe out! My husband will love it – pumpkin and nutella are two of his favorites! Thanks! Great Recipe! I Love all things Pumpkin, and all things Nutella, so this was a match made in heaven! I made it last night, but instead, did Muffins (adjusting the bake time to 18 mins) Turns out, this recipe makes 18 muffins, so I decided to also try a few replacing the Nutella with cream cheese, and another few with peanut butter. Both were delicious alternatives. ! What size is the can of pumpkin that you use in this recipe? I marked this recipe down last year but had been too busy to bake much of anything. I finally got the chance to make it today. Fantastic! Thank you! Baking in my oven right now! Can’t wait to try it:) Thanks for sharing! Does this recipe make 2 or 4 mini loaves? The recipe says to prepare 4 loaf pans but the part under the recipe says it makes 2 mini loaves. It makes 4 mini loaf pans and 2 8×4 loaves. This bread is phenomenal! I took it to school with me and my fellow teachers devoured it. That was in the fall and I still dream about this bread! I loved it so much, I re-posted it on my own blog! Thanks! Thank you for sharing this recipe! I made a batch this afternoon (two nutella mini-loaves, two plain pumpkin) and they are both delicious. I particularly love the soft crumb they have. I substituted 1/2 cup brown sugar for 1/2 white sugar — I have quite the weakness for brown sugar. It was the perfect treat for the first really cool almost-fall day. Thanks again! Pingback: Change is in the air « Laugh. Live. Love. Create. Can you use vegetable oil instead of canola oil? And, by pumpkin you mean canned pumpkin puree, correct? Yes, you can use vegetable oil. Yes, canned pumpkin puree, not pumpkin pie filling. Enjoy! This was delicious! You put a great recipe together. 🙂 My kids and husband and I loved it. This recipe has become a staple at our home and relatives are always asking for it at get-togethers. Even those who don’t like pumpkin love this bread. It’s so moist and easy to make! Pingback: InSocialShares » Fall Is Here And You Know What That Means…Pumpkin Recipes For Everyone! 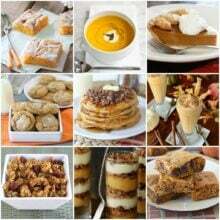 Pingback: Fall Is Here And You Know What That Means…Pumpkin Recipes For Everyone! – The Food Lovers! !